The Aeroflex High Speed Digital Pattern Generator (DPG) family provides the highest word rates and deepest memory digital signal sources available today. The DPG combines a wide selection of digital output modules with very deep digital memory. The DPGs have word rates to 1300 MHz, word widths to 32 bits (expandable to 128 bits using multiple modules) and pattern depths to 16 GBytes. Digital outputs include LVDS, DECL, PECL, TTL, LVCMOS, and RS-485. The pattern memory is segmentable, with programmable sequencing providing an almost unlimited combination of output patterns and lengths. 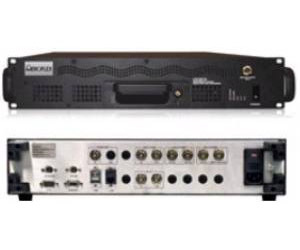 All of these features make the DPG an excellent tool for testing high speed digital processors, high rate DACs, digital input power amplifiers and basestation processors, digital input SDR and legacy radio elements, and other devices and systems that require high speed digital input stimulus.